Ferrari and Red Bull drivers have very similar tyre allocation after the free practices and the qualifying session while the Mercedes duo sacrificed a set of soft tyres in the second qualifying session, meaning they have one set less of the softest Pirelli rubber available in Silverstone. 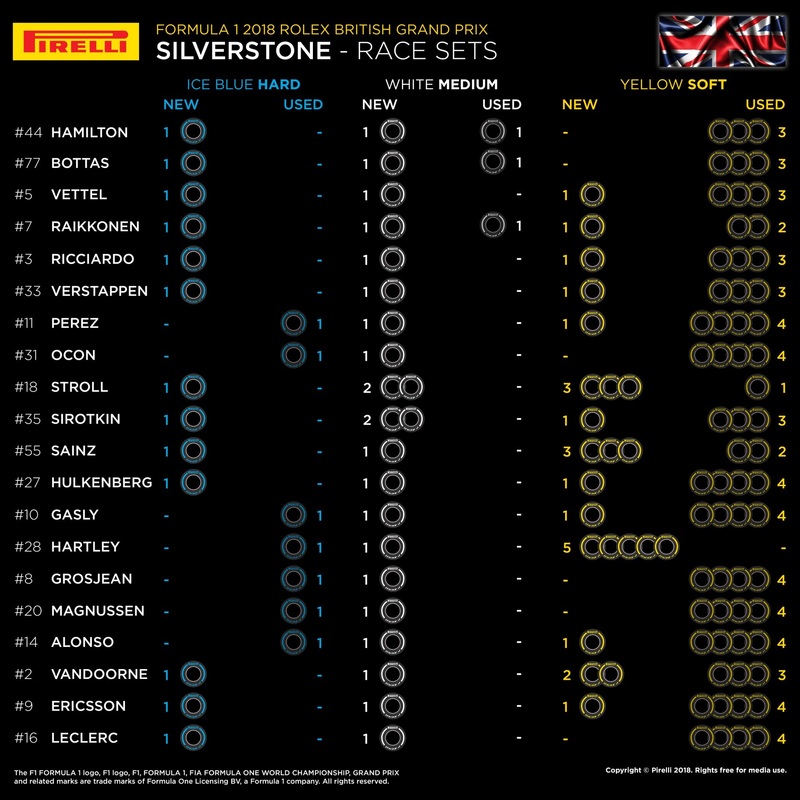 For the British Grand Prix, the Milan-based tyre manufacturer supplied the teams with the soft, medium and hard compounds, making Silverstone the venue of the first appearance of Pirelli's hard compound during the 2018 season. The ice blue-marked hard compound was picked out for Silverstone, the choice was prompted by the brutally high-speed nature of some turns of the British track. Despite to the uncharacteristically high temperatures and track record-beating pace of the 2018 cars, the hardest compound of Pirelli's range has hardly made any appearance over the weekend. So far this year, races have been dominated by the one-stop strategy which was a consequence of the very low tyre wear. However, teams face an uncertainty regarding the optimal strategy for tomorrow's race. 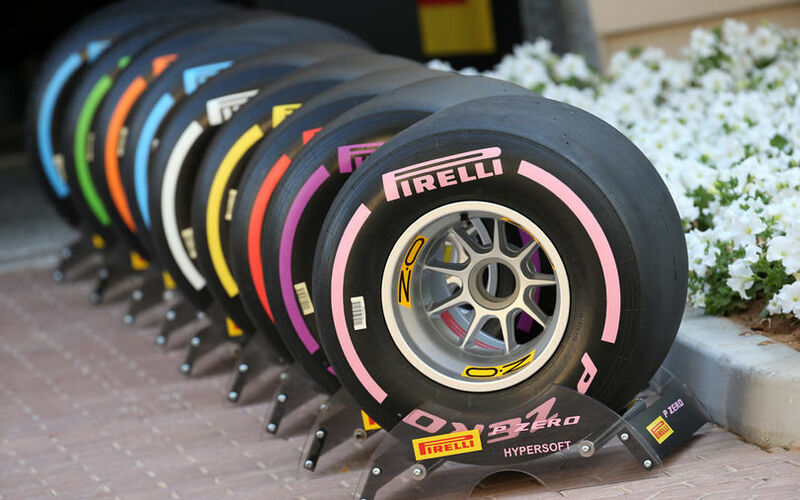 During Friday long running, both the soft and the medium tyres proved themselves quite durable, but there were signs of higher tyre degradation compared with previous races. The likes of Ferrari and Mercedes usually do two runs during the second qualifying segment even if they are completely safe, having already secured the place into the next qualifying section. It is because they want to give their drivers an extra preparation lap before the all-important Q3 running. Because of the usual one-stop strategy, one set of the softest compound available on the given race track would be left unused, so committing to an extra practice lap does not have any consequences on the race strategy. Today's qualifying session affirms the uncertainty about tomorrow's strategy. Mercedes sent both its car out to the track in Q2, giving them the important last preparation round while Ferrari kept its car in the pit. Both Mercedes drivers and Kimi Räikkönen have one set of new and one set of used medium tyre while Sebastian Vettel has only one set of new mediums. Of the softs compounds, Bottas and Hamilton have only used sets while both Ferrari drivers have one set of new softs, having saved that in the last phase of the Q2 session. Assuming that the one-stop strategy would favour the soft-medium duo and the two-stopper would be the quickest with the soft-soft-medium solution, Mercedes' two runs in the Q2 session indicates that the Anglo-German team reckons with a one-stop-strategy. In contrast to that, Ferrari wanted to save one set of soft compound, thinking that the high temperatures would result in higher tyre wear and hence in two visits to the pit lane. If forced to two stops, Mercedes will have a slight disadvantage because of the one flying lap they did in Q2.